As a “Grass Guardian,” Ntaati Lengila has a mission, and one he takes seriously. His job is to protect the grass in the rangelands of Westgate Conservancy, his home in northern Kenya—and no one is going to stop him. Not even the community elder he found inside the Conservancy cutting down an Acacia Tortilis tree. Seeds from Acacia Tortilis trees are important food sources for livestock once they fall to the ground. The seeds also provide cover for the rangelands. Being a Grass Guardian, it’s part of Ntaati’s job to protect these trees. When he found the elder cutting down the Acacia Tortilis, Ntaati quickly intervened, preventing further damage. “Does this tree belong to you?” the elder asked, trying to dismiss the teenager. Ntaati was not to be dissuaded. “Yes,” he replied. “This tree does belong to me.” And with that Ntaati returned to his village to discuss the incident with the community elders in the Conservancy. The man who cut down the tree was fined, which hopefully deterred him from doing any more damage to the grasslands. Ntaati, as a Grass Guardian, had effectively shown his community that he was taking ownership of the land that would one day be left in his hands and the hands of the other young children who live in the Conservancy. The Grass Guardians, or Lkiramat Nkujit, in the Samburu language, is a club created by our partners at the Grevy’s Zebra Trust (GZT). Founded in August 2016, Grass Guardians is comprised of 32 children—16 herders and 16 schoolchildren—living in the Westgate Conservancy. Their goal is to do just as their name suggests; conserve the grass in their rangelands. Rangelands are largely impacted due to overgrazing by livestock, causing land degradation. As pastoralists who depend on their livestock and crops for survival, the local communities in the Conservancy have much to lose if the land is unable to regenerate. Herbivore species like the Grevy’s zebra who share the land with the pastoralists are also affected. Grass makes up their sole food source, and with receding grasslands and increasing loss of habitat, they are forced to migrate further for quality grass to feed on and water sources. Habitat loss, loss of access to critical resources due to competition with domestic livestock, and limited access to water significantly lower their chances of survival. Given that many herders are in fact children, GZT thought it critical to include them in their community conservation initiatives. From the beginning, the children took full ownership of the club, going back into their communities and sharing the holistic rangeland management practices they learned at the Grevy’s Zebra Trust Camp where they were initiated as “Grass Guardians.” They set up “lokerens” (small enclosures for livestock) as a means to plan livestock grazing to regenerate the degraded land; they planted trees and grass in their schools to heal the gullies and increase vegetation cover, and they disseminated conservation awareness messages to their peers. The impact of their efforts are already being seen widely in their communities, and they are only just beginning. Most importantly, the Grass Guardians have begun holding the adults (women, warriors, and elders) in their community accountable for their actions, just like Ntaati did. 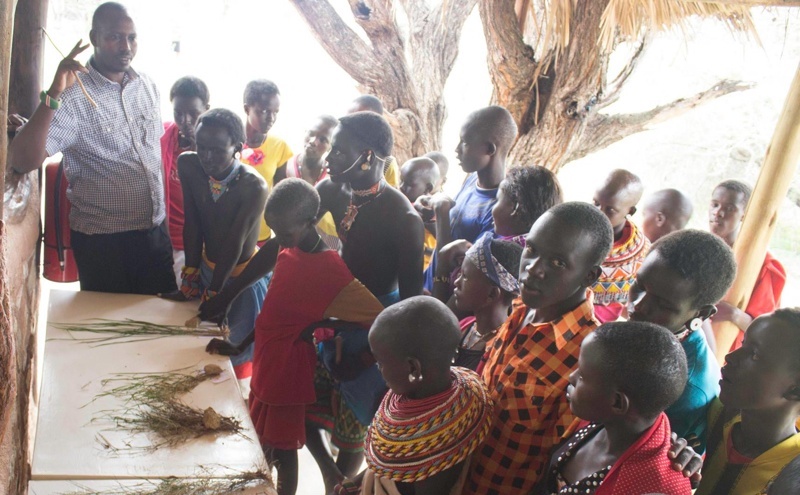 For GZT, reviving the rangelands serves a dual purpose, to protect the land and livelihoods of the pastoral communities, and to protect the multitude of species like the Grevy’s zebra that live in the Conservancy. Grevy’s zebras are the world’s largest and rarest species of zebra, and can be found on the rangelands of northern Kenya and Ethiopia. Unlike their other zebra cousins, Grevy’s zebras have much narrower stripes on their bodies, white bellies, very large rounded ears, and brown muzzles. While they once roamed the land in large numbers, they have experienced a significant decline over the past 40 years, going from approximately 15,000 individuals to around 2,000-5,000 individuals today. The threats they face are many and vary across its range—from being hunted as food to contracting diseases that come from being forced to graze in concentrated areas in large numbers—all of these threats are further exacerbated by the loss of quality habitat due to land degradation and limited availability of water. For GZT to be able to protect this species and reverse this trend, it is critical they involve the local people sharing the pasture-land with Grevy’s zebras to help lead the conservation efforts in their region. Ntaati and his crew of Grass Guardians are the future, and from what we can already see, the future is already looking more secure for Grevy’s zebra.